This is A Very Simple Game! ... that is not so simple to figure out. Join thousands of people trying to figure out one of the most unique and fun puzzle games on the app store. Instructions: Pay close attention to the directions and tap the number that should match the current hand shown. Sounds easy, but It will probably drive you absolutely INSANE. -The ability to make you slap yourself in the head and say "DUH! 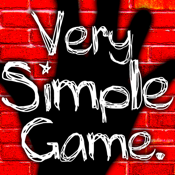 This is A Very Simple Game!" You get all of this absolutely FREE! Special Thanks to a bunch of awesome kids that showed me this silly game: Hannah, Peyton, Brook, Meaghan, Courtney, D.J., Robby, Kyle, Taylor, and Zack!!! Mia's Scribblings font created by Amelia McVinnie. This crazy puzzle game works on iPod, iPhone and iPad for free! *We do not have any official research to back that statement up.